It seems like once or twice a month Whatcom County is making a top 50 list for something. Some of the rankings are more positive than others. As for the less than stellar – Bellingham was rated as the 15th most hungover city in America (dubious claim if you ask me) and Lynden was ranked as 8th most boring. On the plus side, Whatcom County ranks as the 5th healthiest county in Washington State, one of the top 20 cities for writers outside of New York City, and in the top 15 for places for summer vacation. This last one about summer vacation being a no brainer since we all know summers here are the best and make the dreary winter months bearable. While all those lists are a mix of subjective and objective criteria, we just made a list that we can all be pretty proud of, and one in which the criteria is specifically prescribed (pun intended). Whatcom County is the 10th location in the entire united states to have a Secure Medicine Return program. Secure medicine return programs provide a secure and environmentally sound way to dispose of unneeded medicines and are part of a comprehensive approach to preventing prescription drug abuse. The new Whatcom County program will expand secure medical disposal options in Whatcom County, improve convenience for residents by expanding the number of secure drop box locations in the county and provide prepaid return mailers for home-bound residents who don’t have access to drop box locations. Many other forms of waste get a lot of press such as food waste, plastic ocean pollution, and roadside litter – and deservedly so. But pharmaceutical waste is a major issue and it is commendable that our community is taking steps to address it. There is no doubt a secure medicine return program is an integral part of addressing the opioid epi demic and this program will help immensely. However, improperly stored and disposed of opioids is not the only issue when it comes to disposal of medicine. A recent survey indicated 57% of Whatcom County residents have expired or unwanted medicines in their homes for various reasons. Up until now, there has been very little education about what to do with them once they are no longer needed. 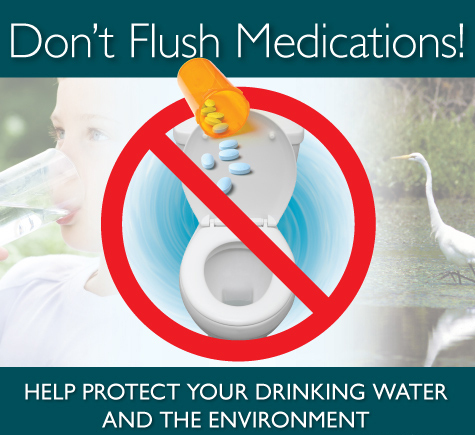 Few people know that all our medicines should be disposed of properly – not just prescription medication and this does not mean putting them in the trash or flushing them down the toilet. 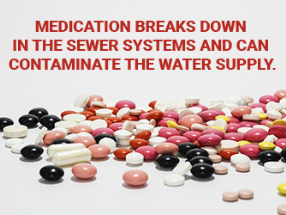 When medicines are disposed of in the landfill they have the potential to leech out into groundwater and if flushed down the toilet some compounds are not captured in the sewage treatment process. In one study 20 different pharmaceuticals were detected in one individual sample after water treatment. Among the medicines detected were various antibiotics, including azithromycin, ibuprofen and naproxen pain relievers, and the active ingredient in Benadryl. For now, however, there remains a tremendous gap in what we know about how many pharmaceutical contaminants are showing up in water and what the effects will be. There is understandable anxiety about the public health implications of pharmaceuticals showing up in drinking water, but experts say we may not have any idea what the actual effects will be of chronic low-dose exposure to these drugs for years to come. While the effects of these trace pharmaceuticals to people are still to be determined, the effects on some marine life is much more clear. A British study showed that marine life is living in a soup of antidepressants and entire marine life ecosystems are being adversely affected. Since these creatures spend their entire life in this pharma-soup the result it causing changes in immune systems, color, and behavior. In yet another study shrimp exposed to Prozac don’t behave naturally and move toward light and are more prone to predation. The fact we consume these creatures is even more concerning and when you consider human drug allergies it may not be the Oregon oyster that is making you sick – it could be the pharmaceuticals they contain. So, what’s the prudent thing to do? Join us in helping to make the Secure Medicine Return program a success and when it comes to unneeded and unwanted medicines don’t take any chances – take them back – to a secure medicine return location near you!